The Attorney General, Lord Goldsmith, has called for the closure of the US detention camp at Guantanamo Bay. He is reported to have serious doubts about whether the indefinite detention of "enemy combatants" is legal or fair. In a speech in London, he said the camp had become a symbol of injustice and its existence was "unacceptable". State Department spokesman Sean McCormack said the US did not want to release people who might "end up on the battlefield" or commit terrorist acts. UK Prime Minister Tony Blair has called the camp in Cuba an "anomaly". But in the strongest worded condemnation yet from a British government minister, Lord Goldsmith said: "The existence of Guantanamo remains unacceptable. "It is time, in my view, that it should close. Not only would it, in my personal opinion, be right to close Guantanamo as a matter of principle, I believe it would also help to remove what has become a symbol to many - right or wrong - of injustice. "The historic tradition of the United States as a beacon of freedom, liberty and of justice deserves the removal of this symbol." Around 490 detainees are in Guantanamo Bay, which opened in January 2002. There has been international criticism of conditions at the US camp and the length of time detainees have been held there without trial. Rights groups have said the detainees, held on suspicion of involvement in terrorism, are mistreated through cruel interrogation methods - a charge the US denies. Lord Goldsmith told the Royal United Services Institute there was a case for limiting some rights for collective security. But he said the right to a fair trial should never be compromised. Nine British nationals at Guantanamo were returned to the UK in 2004 and 2005 after government intervention. Lord Goldsmith said the UK was "unable to accept that the US military tribunals proposed for those detained at Guantanamo Bay offered sufficient guarantees of a fair trial in accordance with international standards". He went on to defend the European Convention on Human Rights and the UK's Human Rights Act. "Fundamental rights must be protected if we are to preserve our democracies but given the current threat to our national security we have to be flexible about how we achieve this," he said. Despite recent legal challenges to control orders, Lord Goldsmith contended that the protection of the public from the risk of terrorism "by means of civil orders and the use of secret intelligence to make out the case is untouched". And he said deportation agreements with countries with a record of human rights abuses meant to guarantee a returnee's safety were a way of achieving the "right balance between collective security and fundamental liberties". 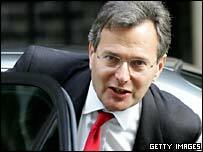 Lord Goldsmith also defended the creation of new criminal offences in the Terrorism Act 2006 to counter "some features of al-Qaeda type terrorism which distinguish it from other forms of crime". "Where we depart from traditional ways of guaranteeing civil liberties we should be clear that our actions are proportionate to the threat and needed to meet it," he said. Echoing the words of US President George W Bush - who in a TV interview on Sunday said he would like to "end" the detention centre - spokesman Mr McCormack said the US would "like nothing better than at some point in the future to close down Guantanamo". "Nobody wants to be a jailer for the world," he added, saying "many detainees" had moved back to their countries of origin. "But the fact of the matter is that the people there are dangerous people. "One thing we don't want to do is release people now who might at some point in the future end up on the battlefield facing our troops or somebody else's troops, or committing acts of terrorism against civilians."